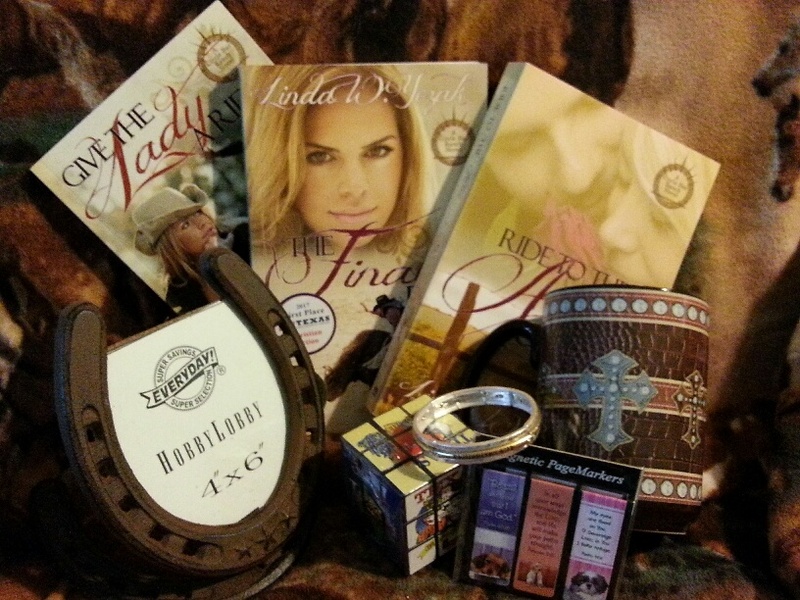 Linda S. Glaz : Author: Linda Yezak Circle Bar Ranch Series/Giveaway! Author: Linda Yezak Circle Bar Ranch Series/Giveaway! I’ve been asked whether I was ever in the rodeo or ever rode a bull. No, the history behind the Circle Bar Ranch series is far more mundane than that. I got the idea from television. Two shows, both on Country Music Television (CMT). Cowboy U was a reality show that aired from 2003 to 2007. It featured eight city slickers who had to learn all about ranch life. The first thing that happened when the contestants arrived at the ranch-of-the-season was their luggage was exchanged for cowboy duds. That meant the women had to do without their nail polish and electric hair dryers. Activities—aside from adjusting to a more rustic lifestyle and learning to ride a horse—included calf-scrambling, steer wrestling, barrel racing, and yes, bull riding. Even the women had to learn, which gave me the idea for Patricia Talbert, my heroine. Later, Ty Murray, founding member of Professional Bull Riders, Inc. (PBR), stepped to the chute. Ty hosted some stars from TV, movies, and sports on his 2000-acre ranch right close to Stephenville, Texas. Since my family once owned a ranch out there, I put my imaginary Circle Bar Ranch in the area. Of course, I took a little license with some of the rodeo arenas in my story, but the location is the same. Some of the folks involved in Ty Murray's Celebrity Bull Riding were musician Vanilla Ice, actor Stephen Baldwin, Ultimate Fighter Josh Haynes. These guys and several others got the full bull-riding experience—thrown, hooked, stomped; broken arms, cracked ribs. By the time they graduated from Ty’s school, they rode an 1800-pound bull in a live PBR rodeo. Compared to the real riding professionals though, they looked a bit like cyclists with training wheels. Both shows were fun for the same reason it's fun to watch anyone adjust to being out of their element. Take your fish-out-of-water comedy and throw some animals into the mix, and you'll get a few giggles. Of course, I got more than that. I got a spark to my imagination. That spark carried over to three novels, Give the Lady a Ride, The Final Ride, and Ride to the Altar—the last in the Circle Bar Ranch series, which tells of Talon Carlson’s and Patricia Talbert’s romance from meeting to wedding. 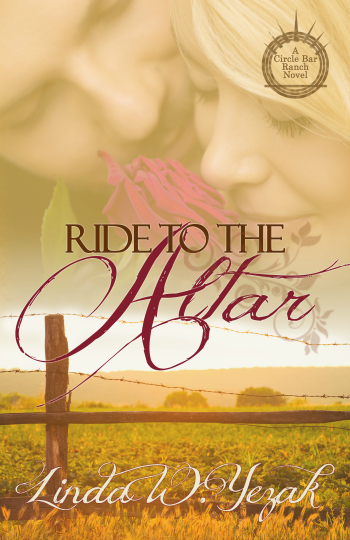 In Ride to the Altar, I throw overwhelming hurdles into Patricia and Talon’s path to wedlock. A past love, murdered years ago and now only a file in an unsolved case, returns to haunt Talon. A long-held grudge demands release, yet Patricia has no idea how very deep it runs until she confronts her mother. An attack against the Circle Bar Ranch itself leaves cattle dead and one of its hands injured. Different from the other novels in this series, Ride to the Altar forces the two to face their pasts individually before they can face the future together. Linda is offering a giveaway prize to one lucky entrant! As pictured, the prize includes a signed print version of the series, a 16-ounce Christian cowboy mug, a horseshoe picture frame, a Ph. 4:13 stretch bracelet, a cute set of magnetic page markers, and a Texas Rubiks cube just for fun. All you have to do to enter is to leave a comment.CHECK OUT THE GIVEAWAY! YEEHAW! Tomorrow’s blog will be Jody Bailey Day’s Love Colored Glasses. Don’t miss it! The winner will be announced Monday, August 6, on Linda's blog, 777 Peppermint Place. Thanks so much for joining me here. And that giveaway looks awesome. Don't miss out, folks! Once her blog tour rides to an end, she'll hop outta the saddle, and lasso a name. Once she's wrangled a winner, she'll post the name as stated above. DON'T MISS YOUR CHANCE! Thanks again, Linda, for visiting! Thanks for hosting me on your beautiful blog, Linda! I'm excited to finish the series. I love rodeos, but bull riding makes my stomach hurt. I'm always terrified until they're off. It's scary until the riders are safely off the dirt and the bulls are back in their pens. Scary business! It's amazing how God brings the inspiration, draws us to write about a profession we don't literally know and helps us craft it into a story that fools the reader...while also tells a tale of redemption :) Keep writing! It is! I love seeing His hand in what I do! Thanks for the comment, Mary. Good luck in the drawing! His hand is so awesome in all we do and results we see.